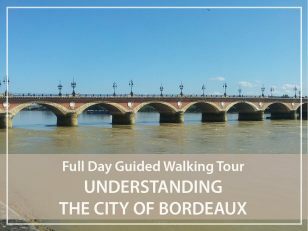 Plan a guided walking tour of Bordeaux listed by UNESCO in 2007! I propose you a selection of places, points of view and monuments to understand the identity of Bordeaux city and how its physiognomy has evolved over centuries. What to visit in Bordeaux in 1 day? To start, if you haven't chosen an accommodation in the hyper-centre of Bordeaux, I suggest that we fix a meeting point outside Bordeaux city center. We will thus be able to enter the city together using the tramway and immerse in the life of the locals. Since the price of downtown car parks has become totally prohibitive in the city centre, I suggest an appointment in one of Bordeaux's many park-and-ride parks (for only 4.50€: daily parking + 1 round trip on the network for each of the car's occupants). The sumptuous 18th century façade of the docks along the Garonne River, the backbone of Bordeaux and its history. The Place de la Bourse (Stock exchange suare) and the water mirror: a magnificent and elegant square designed in the 18th century that is reflected today in a thin film of water; a splendour!! The monument to the Girondins: a gigantic monument to the memory of the Girondins deputies, victims of Terror during the French Revolution. Saint Andrew's Cathedral: a gothic cathedral and its separate bell tower called "Tour Pey Berland", named after the archbishop who ordered its construction. the Grosse Cloche: the former belfry of Bordeaux's old town hall, which was part of the rampart that have now disappeared . This will enable us to understand the different facets of the city. The narrow streets of Old Bordeaux which are the heritage of the medieval past and the wide boulevards of the city lifted up in the 18th century, the golden period of Bordeaux; during this golden age, the city was largely redrawn thanks to the economic prosperity resulting from the wine trade but also from darker activities which are part of our history: slavery, triangular trade and wholesale trade.